This morning I woke up to the rather alarming headline that “dull” ICT was to be dropped from the school curriculum to be replaced by computing. The story coming on the back of a department of education press release summarising a speech to be given later in the day by education minister Michael Gove. I’ve learnt from experience to never judge a story by its headline, and the premise of the story that ICT would be dropped in favour of computing seems now a simplification if not a mistake. Nevertheless the speech did contain criticisms of the current ICT curriculum and described much ICT in schools as dull, this based on the recent OFSTED report similarly criticising much ICT teaching. But the speech did also mention excellent practice and teaching by some schools so it wasn’t all negative by any means. It is a fact that many schools spend inordinate amounts of time teaching students basic office software skills, not necessarily a waste of time but certainly not engaging for a large number of students. But contrary to Gove’s crticisms much of this isn’t necessarily down to the existing curriculum, which is fairly broad and flexible, it’s down as much to the play it safe attitude of schools and a lack of suitably qualified ICT and Computing teachers. ICT in many Secondary schools became a place to pick up league table points by offering GCSE level qualifications based on office skills and ticking boxes. Even in schools where this wasn’t the case the threat of Ofsted and school management lead many schools to feel uncomfortable innovating lest the inspectors or school review system should find out that that basics were not being covered. During my time as an ICT and Computing teacher I was lucky to be able to innovate and bring in new ideas but I was “told off” on more than one occasion for deviating too far from what the other teachers were teaching. This wasn’t a problem with what I was teaching but more a problem that we would find it harder to assess, compare or show we are meeting the same standards when different classes were not all learning the same stuff. From my understanding, today’s announcement gives schools a much freer rein to teach ICT without worrying so much about ticking boxes or being checked up, it sounds like teachers will be given room for innovation… in a best case scenario. In a worst case scenario it could become a box ticking exercise of a different kind, where cross curricular ICT/Computing, both the dream and fear of every ICT teacher, is brought into schools. Cross curricular ICT is done successfully in some schools, where there are no or few discrete ICT lessons and students study different topics in different subjects, sometimes supported by ICT specialists. In reality it is very hard to get to work because in a traditional subject based school curriculum teachers tend to concentrate on teaching their own subject and any ICT would come second, and this is assuming the teachers have sufficient knowledge themselves. The part of the speech today which I am very excited about is the promotion of computing in school. Computing isn’t a subject that every student will love or thrive at. But like many other subjects it’s important that students at least get to try it and learn some programming. The best coders who will truly bring about innovation and entrepreneurship in the future are not necessarily those who need teaching in detail, but at least giving them the chance to learn the basics could give many students a foundation to develop skills in their own time, ala the developers of the 1980s who graduated from the first generation of home computers to write software, games and create some of the household IT names we have today. The announcement by Gove promoting computing is some feat and a massive u-turn in many ways. Computing, always a niche subject, has gradually been dwindling over the last few years. A group, Computing at School was set up by teachers and industry just a few years ago to try and buck this trend and this group, along with industry pressure and pressure from a number of other interest groups they seem to have caught the ear of the government. It’s a major u-turn for many reasons, when the Conservatives came into power one of the first quangos they scrapped was Becta, the internationally renowned agency for technology in education. Not necessarily an anti technology move but it was easy to see it as such. Next was the promotion of traditional teaching and subjects such as latin. Not necessarily anti-technology but computers didn’t have a place in grammar school education of the past. 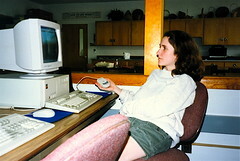 Next was the e-bac, which included many subjects such as history or geography but not ICT or Computing. Finally last year Michael Gove didn’t even turn up at BETT (the UK based educational technology exhibition which draws people worldwide) a statement in itself. Such a big u-turn should inspire extra confidence. But anyone who has been in state education knows that one government announcement doesn’t make real change. All teachers have had the experience of sitting in an INSET (compulsory teacher training) session learning about a new initiative to improve their teaching but in reality finding it another box ticking exercise or finding it scrapped or superceded a year later. 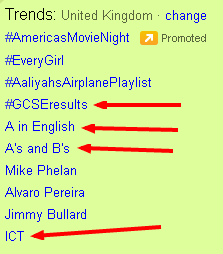 A few years ago the government decided that ICT would be tested as a SAT exam in an onscreen test. I spent 3 days of training along with 2 other ICT colleagues preparing for this, as well as hours of classroom time running the test with students rather than teaching. Our network manager likewise spent hours configuring the software. Not long after we found that the “award winning” test had been scrapped, not just the cost of the project down the drain but all the teacher hours. Bringing computing into schools may also be a large financial investment but with support from industry and other organisations that is set to grow it may just work. There is already a scarcity of qualified ICT teachers in schools, teachers such as myself with a computer science degree are even rarer, but to teach computing to a certain level you don’t necessarily need a degree, you need patience, willpower, support, an abilility to learn but most importantly time to learn. It can happen and I hope it will happen but we’ll have to wait and see! I ran a table discussion at the last c84c at BETT last January (you can see the video at the bottom of this blog post) on “How can we encourage teachers to take risks and innovate with technology”. The discussion was great and the whole event was also fantastic bringing together a massive range of people to discuss and present. The focus will be on looking at why existing innovators innovate, whether there are boundaries or appropriate times to innovate and if we need to plan carefully for innovation or just do it. Posted byD Needlestone August 25, 2011 August 25, 2011 Posted inthoughtsTags: GCSE, student voice, Trends, TwitterLeave a comment on Do Teens Use Twitter? The Purposed Project has got me writing on my blog again rather than just thinking of things I should get round to writing. I’ve taken part in 3 stages of the project starting with my earlier blog post “Time To Learn”, then a bit more passively with this lovely picture quote mashup created and contributed by @grumbledook (thanks and I was flattered). I’m now contributing again with a purposed futured interview. I couldn’t help signing up for another one of these “tasks” as they’re interesting, fun, different and make me and I hope others think about some bigger questions for a short while. This task allowed me to perform my first over the phone interview using Audioboo, as instructed, to record and share the audio. I wasn’t sure who to interview when I signed up but in the end went for someone from a faith community, because I thought it may give a different perspective, and someone from the Jewish community, because I feel it’s an integral part of the privileged education path that I have followed and am still following. Judaism has always been a religion that prides scholarship and learning for the sake of learning, in some communities maybe too much over and above the skills required to earn a living! The immigrant history has also meant Jewish communities have always made education of their children a priority in order to have skills and work that could be transferred from country to country. Having known my interviewee, Rabbi Pete Tobias, for some time, I did not expect a religious sermon or historical lecture. I was surprised though to hear opinions and visions that are incredibly similar to many of the participants and I guess the instigators of the purpose/d project. I hope you enjoy it. Thanks to whoever nominated me, it’s the first time I’ve ever been nominated for anything like this. I started my blog a few years back when Drew Buddie aka @digitalmaverick told me that the process and progress of the VLE I was developing at school was something that would be really useful to share with others. As time has gone on my posts have diversified a little and I am no longer involved in the VLE I started writing about. But there is plenty more to come and many blog posts that are half writen. Take a look at the contents link to see the archive. I hope some of my blog posts are useful to other people, like most teachers who blog, I do it to share and reflect, but it is exciting when the stats hit the roof. This has only happened twice to me: once for my guide to Twitter post earlier this year which for a week was clocking 100 visits a day, and once when I published my MA research on “What gets kids on a VLE“. But if you don’t click don’t feel bad. I’m up against 40 other blogs many of whom I am big fans of, as a whole they are a fantastic compendium of teachers’ experiences and achievements. This is my 500 words for Purpose/d. Another wonderful project from a group of educators looking to inspire, create debate and eventually change. I’m supposed to read the posts before mine and respond to some of the points. I’ve read some but not all, and I’ll use that as my segway to my 500 words, because I just didn’t have time to read them all. And time is surely the killer for much change and innovation in education. There’s precious time to think, to innovate and be creative, and that goes for teachers and students. In the UK, when we learn to be teachers, we don’t learn about pedagogical theories beyond a brief look at learning styles. In a 36 week practical based course there just isn’t time. When I did my MA the largest revelation was that all the things I did anyway in the classroom had a theory attached to them. But good teachers don’t always need a theory, they just do it because it works for them or their students, it just seems right to them. And a good teacher knows what makes it right in one situation doesn’t make it right for every teacher or every class. There’s never enough time in the curriculum for every subject. Recently I’ve seen online campaigns to save PE, RE, ICT and Computing from being removed or marginalised in the UK. Campaigns led by specialist teachers and national subject associations may seem self serving, but they do it because they care. After all remove sports and kids may become unhealthy, remove RE and kids may become intolerant, remove ICT and kids may become unskilled. I can’t disagree with the passion of these teachers who know the ‘Purpose’ and the benefits of what they teach. I’ve been out of the classroom now for 6 months. People ask me if I miss it and how life is different. There are many differences but the biggest one is not having the guilt on your shoulders because there isn’t enough time to do everything for your students. Teachers learn to live with many kinds of guilt; the guilt of not preparing enough, the guilt of not marking enough, the guilt of ignoring a school policy, the guilt of straying from the scheme of work, the guilt of setting too much homework. What is the ‘Purpose’ of all these things we worry about? 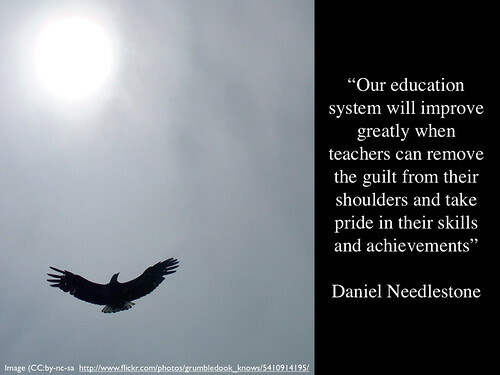 Our education system will improve greatly when teachers can remove the guilt from their shoulders and take pride in their skills and achievements. I subscribe to the terribly liberal but certainly not revolutionary philosophy that different students and different teachers have different needs. We need different routes, different pathways and different systems open to everyone to enable each learner and each teacher to find their own way. There’s never enough time to teach everything and one, just one, purpose of education must be to give students the skills and the passion to learn and thrive in their own interests in their own time. What is the overall ‘purpose’ and how do we get there? I don’t know but if we are to find it we need to give teachers the room to innovate, experiment and improve and we need to give students room to innovate, experiment and improve. And on that note I’ll leave you with a video of a discussion I led on this topic at the recent Collabor8 4Change event. As promised in my earlier blog post “Why Twitter is good for teachers – thanks to…” here is the video and some brief written tips, on Twitter for teachers. This video was part of a longer presentation I gave to an international group of teachers at the World ORT Wingate Seminar 2011 on Digital Content Creation for learning. Twitter is not just a website for celebrity gossip, it’s a constant stream of information from the people you choose to follow. If you choose to follow teachers or people with similar interests to you, you will get a stream of information relevant to your interests. I follow about 1500 people, most teachers and educators and some with other interests. Following someone doesn’t mean I agree with them always, in fact I follow some people who have very different opinions to me so I get to hear different perspectives. 1. As a supportive community – people are always williing to give their support or opinions when necessary. 2. As a great source of new websites, resources and ideas – People are always posting links to great new resources, blog posts and personal experiences. 4. As a personal search engine – if you ask for help – people normally respond with help or ideas – though it’s not instantaneous and you sometimes need to ask a few times. A good place to start is by signing up, having a look at my twitter profile www.twitter.com/nstone and seeing who I follow and who follows me. If they seem interesting click to follow them, you could even send them a brief message to say hi and to tell them why they look interesting. You can also look at twitter lists to see who they are following. Users sometimes group people they follow into lists, you can see them on their profile. These lists can be great ways to find interesting people fast. If you are a new user and scared about privacy you may wish to choose a private account – then only people you give permission to can see your twitter messages. Going public means anyone can see your messages, but it also means anyone can help you and opens your tweets up to a much wider potential audience. If you’re nervous start private and you can always change later, even for a private account, as with any online communication, don’t assume confidentiality of anything you write!